Spectacular cabin located on the widest stretch of the the river! If you like the feeling of being tucked away in the North Georgia mountains, yet having all the luxury of a resort, then the Hunter's Lodge is the place you want to be. Constructed of native river rock and cinnamon colored logs, this theme adorns both the outside and inside of this spectacular North Georgia cabin. With three large bedrooms, Hunter?s Lodge is the place for a family reunion or a gathering of good friends. The family area has an entire wall of stone, with a built-in fireplace and 65" 4K TV on one side and a wall of windows facing the spectacular Coosawattee River on the other. The cabin will be a hunter?s dream, adorned with deer heads, antlers, fish, and more! The extra-large kitchen with ample seating and an island allows everyone to gather round and chat while enjoying drinks and some fresh Georgia Mountain trout freshly caught in the river on the private dock. Three large luxury bedrooms all with 400 plus count bedrooms gives you enough room to sleep 14 guests. Additional sleeping spots are available for one more guests for an additional charge of $20/person/night plus additional cleaning fee. The lower level has a full-size pool table, beverage cooler, another floor-to-ceiling river rock fireplace, and decorative leather seating. It's a great space for playing games, karaoke, Playstation 3 watching a ball game, or just hanging out when you don?t feel like getting outside. And if this isn't enough to entice you, let?s step outside where the fun really begins! Located on the widest stretch of the Coosawattee River, you can sunbathe on a rock, sit on the deck which overhangs the river, relax in the swing built for two, nap in one of the two hammocks off the master, or just soak up this gorgeous North Georgia setting from the hot tub. For our more athletic guest, basketball and for the more mellow mountaineer, horseshoes. The gang will have a blast playing volley ball and 4 square! Don't forget to take advantage of the fire pit. Located at the river's edge with plenty of seating, it's the perfect way to end the perfect day. There are so many incredible places to enjoy your time in this beautiful North Georgia cabin. Situated in the Coosawattee River Resort in Ellijay, the cabin's location offers plenty of activities both inside and outside the resort if you care to venture away from this spectacular North Georgia cabin. For those looking to explore the true heart of the North Georgia mountains, historic downtown Ellijay is a friendly haven welcoming adventurers to experience its warmth. Settled within the elegance of the Blue Ridge Mountains, downtown Ellijay is a busy marketplace that is situated on the Coosawattee River where the Ellijay and Cartecay Rivers merge. The Tabor House Museum, the Civil War library, and several historic buildings draw people from all over to trade mountain crafts and stories. Stop by the Saturday farmers market or venture to the Cartecay Vineyards. There are festivals, trails, antiques, and apples all waiting for you! Huge cabin with plenty of room on the 3 levels. Tons of outdoor space as well, sits on the largest stretch of the Coosawattee River where you can sit on the rocks or tube. Interior is custom throughout with granite counter-tops, upgraded appliances and bathroom on each level. Close to downtown Ellijay with plenty of restaurants and shops. This cabin is awesome! very cozy and with the river view a major bonus!! Perfect house for 3 families. So well stocked. Inside and outside exceeded expectations. Beautiful. Felt like your own private resort! 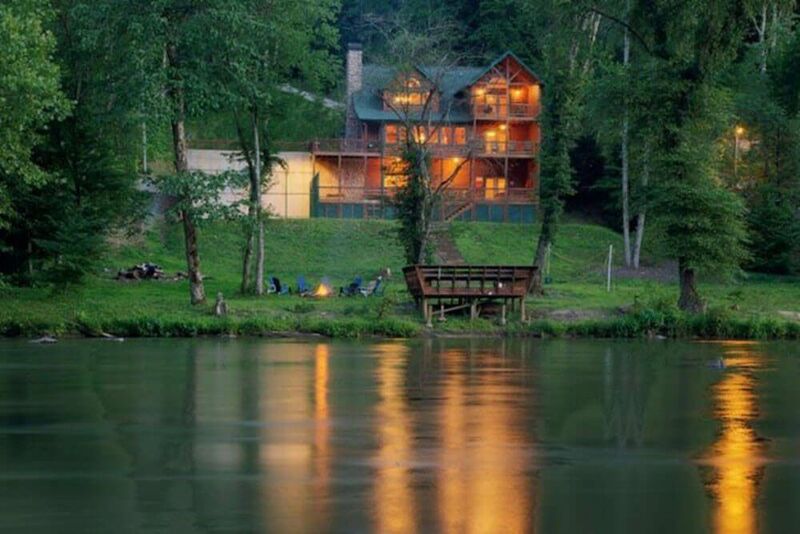 Spectacular setting in the North Georgia Mountains with swimming, kayaking, tubing and fishing from your back door. There are tons of hiking trails within minutes of the cabin, including the Benton-MacKaye, which is a feeder of the Appalachian Trail. Horseback riding is nearby and world class trout fishing as well. There are several wineries in the area for tastings and live music, zip-lines, bike riding, boat rentals on several lakes in the area and plenty of great shopping and eateries. Plus this area is the 'Apple Capitol' of Georgia with the huge 'Apple Fest' every October and over a dozen apple farms with 10-15 mile radius.